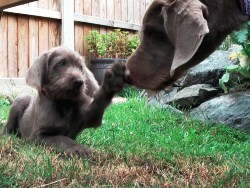 This hunting dog breed was established by crossing German Wirehaired Pointers, Weimaraners, and the Cesky Fousek (also known as the Bohemian Wirehaired Pointing Griffon). The developer, Koloman Slimak, wanted a dog with great stamina which would track, point, retrieve in water or land, and be suitable for a range of prey from birds, hares and other small animals, and large game up to the size of deer. The Slovakian Rough Haired Pointer breed has had slight input from the German Wirehaired Pointer and Pudelpointer as well. This breed has strong tracking, pointing, and retrieving skills on water or land. 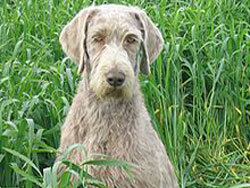 The silver/grey coat is moderate in length, wiry and this breed has facial whiskers. They have a very nice temperament and bond well with their owner and family. The Slovakian Rough Haired Pointer was first introduced into the United Kingdom in 1997, and was recognized by the United Kennel Club in 2006. Additional breed information for the Slovakian Rough Haired Pointer can be found at the United Kennel Club website.